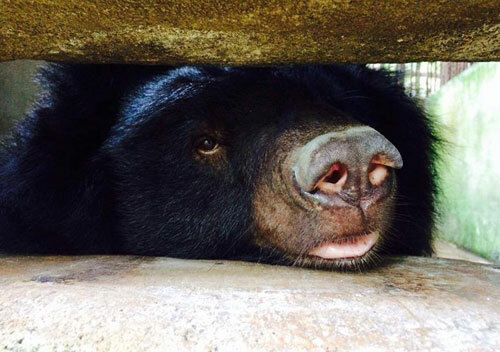 HA NOI (VNS) — Three moon bears, which were being kept at two private farms in the Ben Tre and Ba Ria-Vung Tau southern provinces, were sent to the Viet Nam Bear Rescue Centre in the Tam Dao National Park in Vinh Phuc Province on Monday evening after having been rescued by Animals Asia. Two of the three moon bears were voluntarily transferred by Pham Thi Thanh Binh, who had raised them since 2000 to extract bear gall. The male bear weighed 150 kilograms (kg) and had lost his right hand, whereas the female bear weighed 160kg and had lost her left hand. Animals Asia was of the opinion that this could be because they had been caught in traps earlier. The remaining moon bear weighed 200kg, and was also transferred by the farm owner. The moon bears' health was checked by a rescue team from Animals Asia.